Please feel free to get in touch with me to discuss dish set orders. I realize this is a big purchase for most people, especially if you are planning to order an entire set, so I am happy to discuss your preferences and any other details with you and answer any questions you might have. Please also read the entire listing before purchasing. The dishes I make are for daily use and are made to last for years to come. These plates feel hearty in the hand and are durable. The rims of the dinner plates measure about 1/4" and will not chip easily. The dishes shown in the photos above are from various sets I’ve made recently. 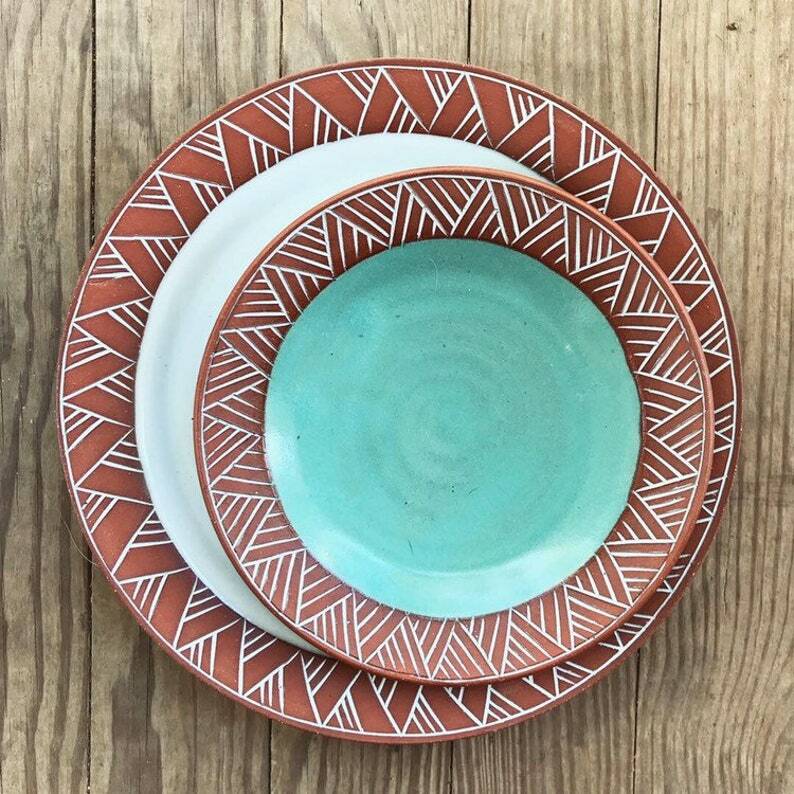 I am a fan of “mismatched sets” featuring a variety of glaze colors but if you’d like all matching glazes, that’s fine, too. The dinner plates in the photo are 10" diameter, the small plates are 7.5-8". I measure each plate as I throw them to make sure they stack well in your cabinet. The glazes I use are food safe, microwave safe and dishwasher safe. Please allow for some slight irregularities in glaze coverage. I cannot guarantee the absolute flawless perfection of manufactured dishware. I apply glazes by pouring them on by hand. You will see evidence of this process on the dishes you order. Please zoom in on all photos in the listing before purchasing. This item will be made to order, just for you. It can take me up to six weeks to complete a dish set order, so please be patient. If you need something right away, check the "Ready to Ship" section of my shop. The item(s) you receive may vary slightly from the photos above, as is the nature of pottery made by hand. Please feel free to get in touch in the meantime with any questions or concerns. The mug is beautiful and arrived on time. I'll be giving it to my sister for her birthday soon and she is going to be so happy! We both have been admiring your work for a long time. Thank you, Osa. Very beautiful, high quality piece. I look forward to planting something beautiful in it! See my Shipping Policy for what to do if you receive a damaged package. If you are unhappy with your order for any reason, please contact me directly. It is important that all of my customers feel satisfied with their order, whether that means a full or partial refund or exchanging the item you got for another that meets your expectations. All packages are securely packaged (see my reviews) and also insured. Incidence of breakage during shipping is very rare. But, if you do receive a package containing items that were damaged during shipping, find the tracking number on your invoice, take photos of the damage and visit this website to file an insurance claim: https://www.usps.com/help/claims.htm. Don't worry, it's a simple form to fill out and they WILL pay you back! After you are reimbursed, you may re-order your items if you wish.